For the second time in two years, the Arizona RV and Camping Guide won the State Directory of the Year Award from the National Association of RV Parks & Campgrounds (ARVC). The 32-page color guide features more than 90 campgrounds, RV parks and resorts across the Grand Canyon State. 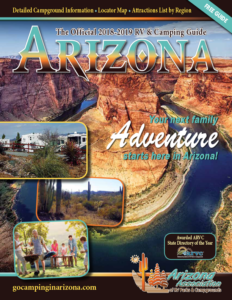 The 2018-2019 Arizona RV and Camping Guide was designed and produced for Arizona ARVC by Crowley, Texas-based Texas Advertising. Texas Advertising has produced Arizona’s camping guides for the past three years, including the 2016-2017 guide, which also received a State Directory of the Year Award from ARVC. The campground directory is distributed to chambers of commerce and visitors centers and through campgrounds, RV parks and resorts that are members of the Arizona Association of RV Parks and Campgrounds. The association also provides a digital version of the guide through its travel planning website at www.GoCampingInArizona.com. The guide is supported by national advertisers, including Encore RV Resorts, Roberts Resorts as well as Geico Insurance. The deadline for advertising in the 2019-2020 camping guide is March 30.